This is a late review that has been hanging over me a month. I read all volumes of this manga series in October and November, but I wanted to review the work as a whole. I consider Hayao Miyazaki a genius and one of my favourite artists and film makers ever. The Ghibli films are special to me and his work does move me. This series is definitely one of his best works. This series has a lot on humanity and it covers so many facets of life. It’s beautiful. I found it emotional and so detailed to read through. 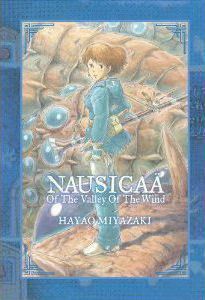 The character of Nausicaa is incredible. I wish this series would be turned into a live action or a mini series. That won’t ever happen, but this to me is better than anything HBO or the cable networks put out to adapt. This work is more grim than some of Miyazaki’s films, but it does have moments of hope. It has moments of whimsy, magic, death, innocence, and honesty. As usual, there are many characters and amazing moments. I love this work. It is now one of my favourite graphic literary works. I do wonder if I should buy it for the ages. Read October to November 2018.